This blog post follows on from our first Grade in Britain blog post, back in April 2016. Much of that is still relevant, but we can now give a bit more detail on how some of the main species grade. This is still research in progress, so keep an eye on this blog for more. Sitka spruce (Picea sitchensis) (EN13556 marking code PCST). Characteristic density of ungraded UK-grown Sitka spruce ranges from about 310 to 350 kg/m3. Characteristic strength ranges from about 13 to 18 N/mm2, and mean stiffness ranges from about 7 to 9 kN/mm2. It is therefore the stiffness that tends to limit the structural grading, but when grading to C16 alone the machine reject is minimal anyway. For this C16 graded timber, strength is higher than the C16 requirement (more than C18 requires) and density is actually the least critical property (sufficient for C20), but still low enough to make Sitka’s high strength to weight ratio another one of its practical advantages. You cannot, however, make use of that extra strength and density in design unless you are using our bespoke timber grade for UK spruce, “C16+”. With the right grading machine, yields of about 25% C24 with 75% C16 and minimal machine reject are achievable, and while likely not economic on an industrial scale for primary processing, this may be viable for one-off projects. 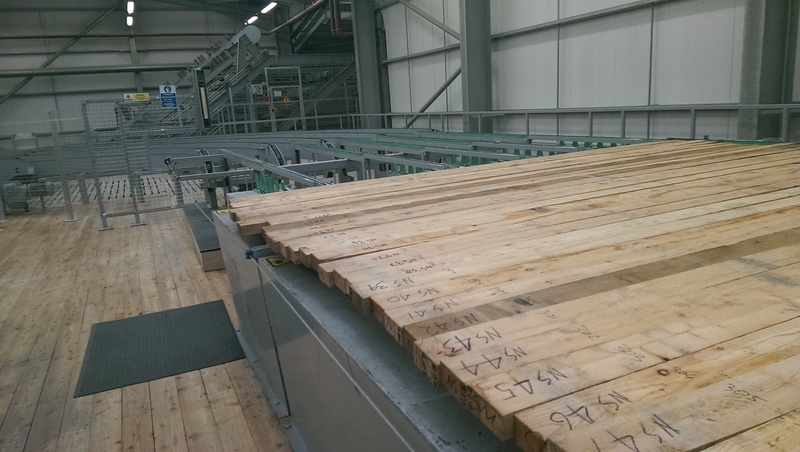 Grades of up to C27 and TR26 can be achieved in small amounts, and while unlikely to be practical, it does illustrate the range of timber properties within a species from even a relatively small growth area like the UK. Visual grading to BS 4978 assigns to C14 and C18. The coefficient of determination (R-squared) between strength and density in UK-grown Sitka is only about 0.2, due partly to this species growing relatively dense, but less strong, wood in the early years of growth. Norway spruce (Picea abies) (PCAB) is grown and processed together with Sitka in the UK and constitutes about 10% of the species combination we call “British spruce” (WPCS). The sawn timber is practically undistinguishable and the wood properties are essentially identical, although we do suspect the stiffness is probably a little higher. The grading is therefore the same as Sitka above. Larch in the UK (WLAD) is a mixture of European larch (Larix decidua) (LADC), Japanese larch (Larix kaempferi) (LAKM) and hybrid larch (aka Dunkeld larch) (Larix x eurolepis) (LAER). The wood properties of these species may be regarded to be the same for home grown timber. The characteristic density of ungraded UK-grown larch ranges from about 400 to 420 kg/m3. Characteristic strength ranges from about 19 to 22 N/mm2, and mean stiffness ranges from about 9 to 11 kN/mm2. It is therefore, again, the stiffness that tends to limit the strength grading, but larch can achieve C20 or C22 as a single grade with minimal machine reject. With the right grading machine, yields of about 30% C27 with 70% C16 and minimal machine reject are achievable. Grades of up to C35 can be achieved in small amounts. Density is, again, the least critical property and even ungraded it is higher than the C40 requirement. Visual grading to BS 4978 assigns to C16 and C24. The R-squared between strength and density is similar to Sitka, only about 0.2. Home grown Douglas-fir (Pseudotsuga menziesii) (PSMN) is, overall, quite similar in properties to UK larch, but is much more variable from stand to stand and this variability requires the grading to be more conservative. This variability also causes the characteristic properties of the ungraded timber to be very low, although they are quickly improved by grading. The characteristic density of ungraded UK-grown Douglas ranges from about 360 to 450 kg/m3. Characteristic strength ranges from about 10 to 25 N/mm2, and mean stiffness ranges from about 8 to 13 kN/mm2. For Douglas it is the strength that tends to limit the grading and, ungraded, it does not meet the requirements even for C16. However, because the characteristic strength can be quickly increased through grading, the machine yield of C18 as a single grade is about 95%. With the right grading machine, yields of about 65% C24 with about 25% C16 and about 10% machine reject are possible. Grades of up to C40 can be achieved in small amounts. Once again, density is the least critical property, and while lower than Douglas-fir grown in Europe it is, when ungraded, at worst, higher than the C27 requirement. Visual grading to BS 4978 assigns to C14 and C18, or C24 for large dimensions. The variability in the population means the R-squared between strength and density is quite high, at about 0.5, but can be non-existent within a batch of timber.